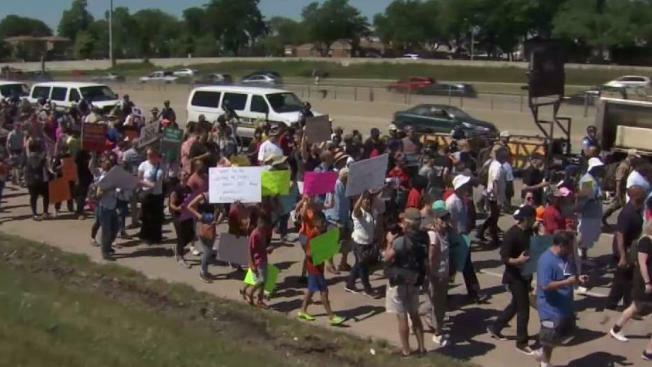 Protesters shut down the Dan Ryan on Saturday, sparking conversation and controversy. NBC 5's Ash-har Quraishi has the story. As hundreds of officers and dozens of city vehicles lined lanes on one of Chicago's busiest roadways, protesters marched onto the Dan Ryan Expressway shutting down all northbound lanes on the city's South Side as they called for an end to the city's violence. The massive crowd chanted "shut it down right now" as they stepped onto the expressway confined to one lane and a shoulder. But as the crowd stalled, pushing up against a police line near the 76th Street overpass, things changed. Illinois State Police initially said officers would create a boundary to allow the protesters one lane plus the shoulder. "We all intend to live up to that agreement," ISP said in a statement. But as the march stopped not long after it began, reports from the scene indicated Rev. Michael Pfleger was negotiating to have authorities shut down all northbound lanes of the expressway. He could be heard telling the crowd "we're making progress" and moments later, the northbound lanes were blocked at 79th Street and the march continued. "Today we got their attention; now, we want action," Pfleger said after the march. "Today, the people won and the Dan Ryan was shut down, and the march was completed." The protest did not come without controversy as police and Pfleger butted heads about the event in the weeks leading up to it. Mayor Rahm Emanuel on Friday publicly backed the peace march calling it "important"
"Think about this," Emanuel said at an unrelated news conference. "They're going to raise an awareness that's important if we're also going to make progress ... in making sure that our streets are safe. But I want to also widen everybody's lens." Crowds chanted “shut it down right now” as they marched down one of Chicago's busiest expressways on Saturday. When asked, Emanuel said Pfleger and the march's participants should be allowed on the busy expressway. "They should be allowed, yes, because they're going to be talking about anti-violence," he said. Protesters called for five things, according to organizers: "resources for our communities, national common sense gun laws, jobs, excellent schools and economic development." For days, Pfleger promised to temporarily shut down the expressway on this date, despite a warning from state police that participants on the expressway would face arrest. "This is not about just a march," Pfleger said at a press conference, pointing to news of 61 children struck by gunfire so far this year. "This is not about just an interruption of traffic. This is about the violence in the city of Chicago." The event quickly gained the support of Rev. Jesse Jackson, community leaders and others. “No threats will stop us, no jail cells will contain us,” Jackson said. State Police, in a statement released just days before the march, warned pedestrians "not to enter any expressways in Illinois, or they will face arrest and prosecution." "This call to protest on the Dan Ryan, however well-intentioned, is reckless," ISP Director Leo Schmitz said. "It puts the lives of protestors and people in the community in grave danger." Police said they strongly discouraged the protest and met with Pfleger to discuss the dangers of doing it, from causing potential hazards for traffic on the expressway to putting the protesters themselves at risk. "The ISP supports the First Amendment right to peacefully assemble, so long as it does not put the safety of the public in peril," police said in a statement. Schmitz told NBC 5 that state police aren't looking to arrest people, but they worry about the march risking public safety. "Tens of thousands of drivers will be affected," he said. Pfleger and others noted major arteries are often shut down for public events and construction. "If you can shut down Lake Shore Drive for more than a day to install a bridge, then we can shut down the Dan Ryan for two hours to get the justice that we deserve for these innocent lives being lost left and right," one teen said.